Titanic day. On April 10th, 1912 is the day the unsinkable Titanic sank. Inside: do you want to build a Titanic? Are you looking for engaging Titanic resources to celebrate this year’s Titanic Day? 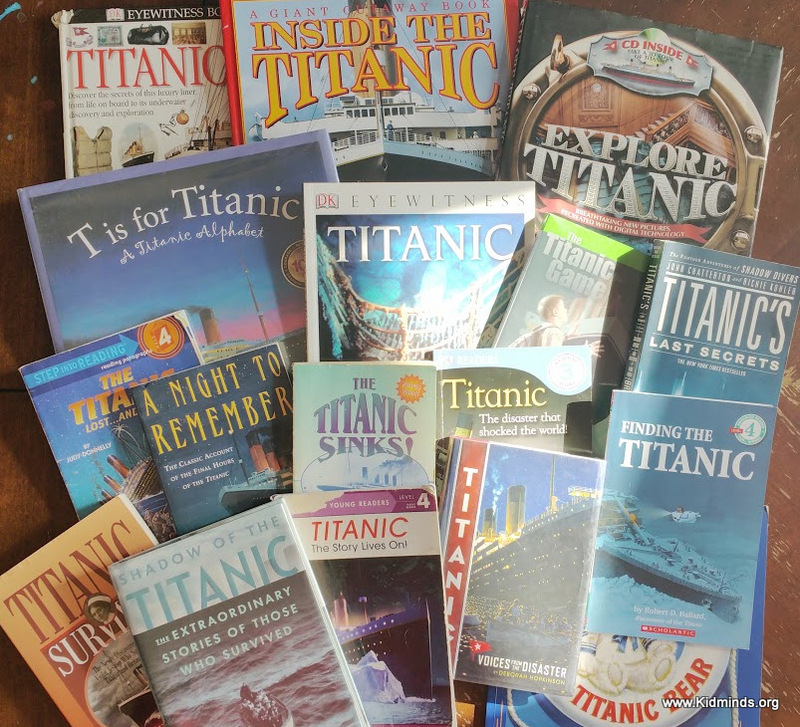 We have Titanic books, games, math and more. Today marks the 103rd anniversary of the Titanic disaster. On April 10th, 1912 the “unsinkable” Titanic started on her maiden voyage with 2,223 passengers and crew. Four days later it hit an iceberg and sunk in the wee hours of April 15th claiming more than 1,500 lives. We have read so many books with names like The Titanic’s Last Secrets and Missing Pieces about Titanic’s final moments that I am almost ready to join one of those Secret Titanic Societies (you wouldn’t believe how many there are). I’m also hoping (beyond all reason) that they would discover one little new detail that will explain the whole disaster in a reasonable light. Because acknowledging that the accident was random, a case of “bad luck” means anything bad can happen at any moment to any of us. And it’s just too much to worry about it. Disclaimer: this post contains Amazon affiliate links. If you buy a product through my link, I will get a small commission at no cost to you. Thank you! 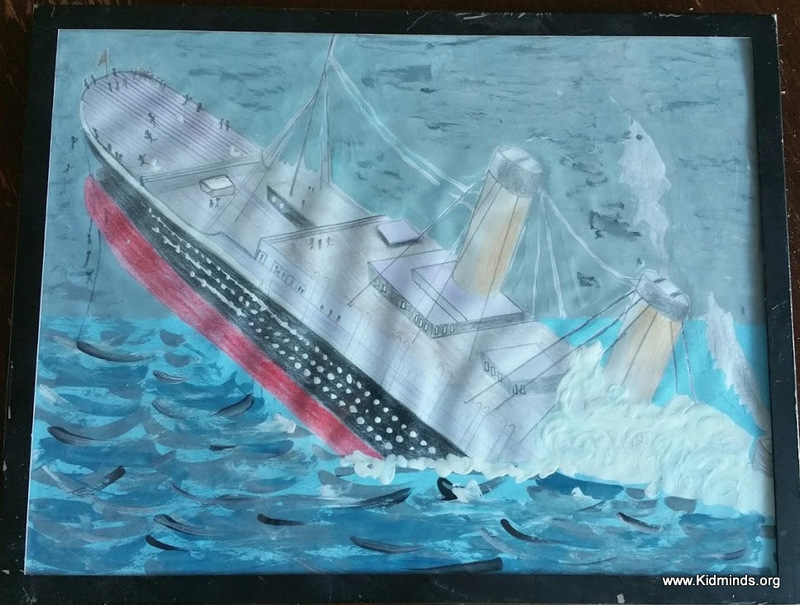 Let me just start this post by saying that Titanic has been a huge part of my life since mid-July 2014 when my son accidentally came upon his first Titanic book. What does “a huge part of my life” really mean? I hear the word “Titanic” at least 100 times a day. I regularly, if not daily, play Titanic games, watch youtube Titanic videos, make Lego Titanic (which is not officially LEGO but looks like one), listen to Titanic books in a car (A Night to Remember is a big one), do Titanic crafts, color Titanic coloring books, and read Titanic books until I’m hoarse. By the way, did you know that the last Titanic Survivor died in June 2009? Millvina Dean was only 9-weeks old when Titanic sunk. I always knew shopping at Amazon is beneficial. One look at their boxes and you are inspired. My very inventive husband used Amazon boxes to put together this incredible Titanic. They just studied the plans for the Titanic from our books and with a little bit of glue and determination put it together. The best feature of this Titanic is that it’s an interactive toy. In fact, the kids have been playing with it for a few months now. (Update: Kids have been playing with it for a few years now). The middle flap opens up and kids can hop inside. Here is my six-year-old peeking out. All three kids can spread out in the bottom section of the ship. (Forgive me, “bottom is for babies,” says my six-year-old, “hull” is the correct term here). Once Titanic was built, the next step was to paint it. And here she is… a thing of beauty. Note the fine details, like crow’s nests and red trim on the bottom (pardon, on the hull). 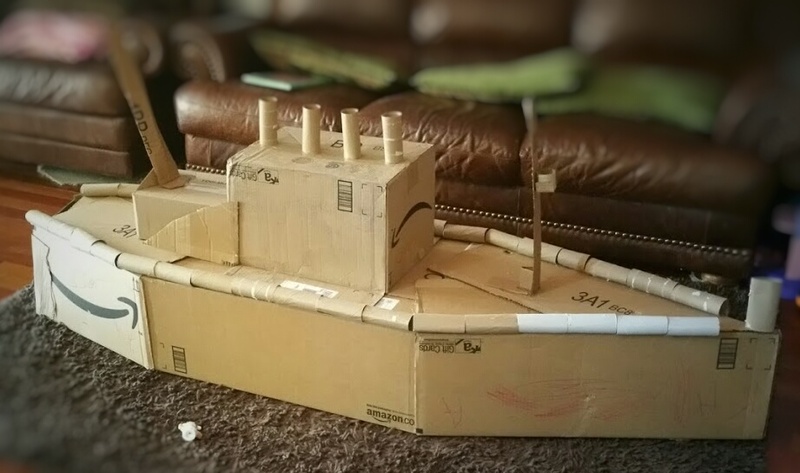 Create a boat-shaped form out of large cardboard boxes (it really REALLY helps to use Titanic books for reference). Use a glue gun, if you have one, and heavy-duty Scotch tape to make it keep its shape. Attach a large box on top (roughly in the middle) and a smaller one directly in front of it. Make two long stripes with a crow’s nest for the front and for the back, plus four smokestacks for the middle. String a row of paper rolls for the rails. If ever there was a better way to work some math into our day, I didn’t hear about it. Titanic has so much math associated with it, from building plans and graphs to provision acquisition and linens distribution. My kids are a bit too young for most of it, but there is still a lot of interesting stuff left. 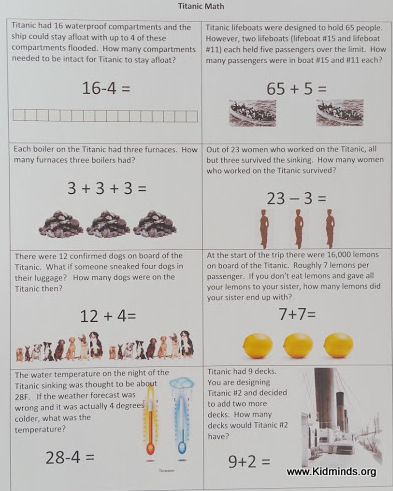 There is a free printable of the Titanic Math at the end of this post. Did you know that there were 40,000 eggs on board of the Titanic? That’s 18 per person! What if I gave you my 18 eggs, how many eggs would you have then? My kids love it, but if you have older kids who are ready for more challenging stuff, I really like this website. 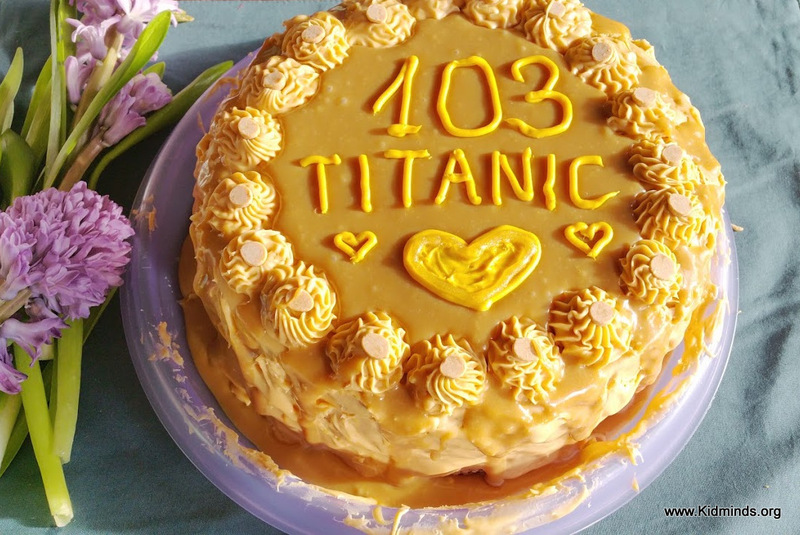 To commemorate the Titanic’s anniversary we baked Titanic Cake (it’s actually a three-layer Butterscotch Cake). Here is the link to the recipe. I posted it last month. It’s an easy and fun introduction to money. Here is the link to the game and a printable. I have more drawings of the Titanic that I care to have in my house, but that’s what you get when you live with a Titanic enthusiast. Here is our most successful drawing. I used a combination of pencils and paints to draw/paint it. My son looks at it every night before turning off the lights. I’m very flattered! I hope our Titanic ideas will be useful to you. Hey Buddy!, I found this information for you: "Titanic Day". 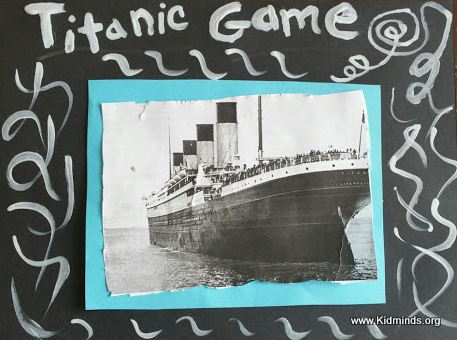 Here is the website link: http://kidminds.org/titanic-day/. Thank you.